Eurodollar is still being corrected; price broke local maximum and right now is moving towards level of 61.8%. Considering that near this level there are several confirming fibo-levels, this is exactly the place where pair may reverse inside it, 1.3630 – 1.3620. So far, I’m opening short-term buy orders. As we can see at H1 chart, price is being corrected right now, but may start growing up again during the next several hours. According to analysis of temporary fibo-zones, upper target levels may be reached during Wednesday. If market rebounds from them, bears may reverse and start new descending movement. Franc broke minimum and right now is falling down towards level of 61.8%. If pair rebounds from it, I’ll close my sell orders and open buy ones. So far, I’ve got one short-term sell order. 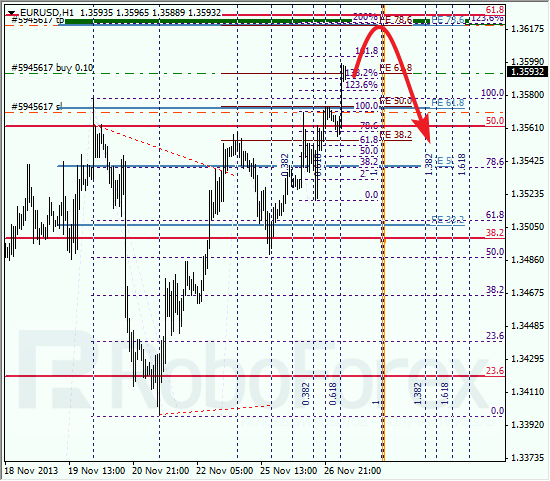 At H1 chart, we can see that correction is taking place, during which I’ve entered the market. Close to level of 61.8%, there are several smaller fibo-levels, which make target area even more important.